The numbers of Pros who have burned up a drill motor by trying to mix with it is roughly equal to the number of Pros that have ever mixed material. Until recently, there haven’t been many good options for cordless mixing, so we all just kind of settled in and thought “someday…” With the Milwaukee M18 Fuel Mud Mixer, the wait is over. Or is it? Certainly, the function of a mixer is simple enough, but can Milwaukee muster enough strength from their M18 battery platform to make it work? That’s the question we’re in the process of answering currently, but let’s start with a look at the tool’s overall design. One of the reasons a cordless drill is tough to use for mixing is that the gearing is all wrong. At best, you can work in low speed/high torque mode. But even if you use the variable speed trigger to keep the RPM’s down, the motor still struggles to keep up with the constant load. A brushless motor helps, but you’re still likely to hit thermal shutdown before you finish the first bucket. The Milwaukee M18 Fuel Mud Mixer takes advantage of a larger brushless motor so it has the electronic communication it needs to protect itself and the muscle to mix as a primary function. Powering that motor is an M18 battery (5.0 AH if you buy the kit). The pack orients in a way that you can set the mixer to stand on it, even when you have a paddle installed. The Milwaukee cordless mud mixer has several ways to adjust or maintain speed. There’s a handy variable dial with RPM markings rather than just speed 1 – 8. Its position allows you to adjust speeds on the fly with your thumb. The trigger is a variable speed design that’s large enough for two fingers to fit on it comfortably. Since mixers tend to stay under load much longer than other drills and drivers, it’s an important feature to help keep finger fatigue low. But realistically, most of us will turn to the lock on button when mixing. Again, it’s to help avoid the fatigue that sets in from both controlling the mixer and keeping the trigger down. It’s a nice feature to have, but I would like to see the button stick out more or for it to be larger. It’s rough on an ungloved hand and really tough to activate with gloves on. You might be a little disappointed to find that there’s no keyless chuck on this model. With keyless chucks being so prevalent in the industry now, it’s a bit of a surprise to see Milwaukee go with a keyed system. But again, the load on a mixer is very different than the load on a cordless drill. 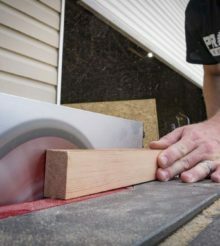 It’s possible – and even probable – that Milwaukee found too much paddle slippage during testing to go with the keyless chuck. At least it stores on board and out of the way on the end of the left handle. An LED light on a cordless mud mixer? I don’t know how necessary this one is. However, it’s a simple addition even if you only need it 1% of the time. If it’s going to be dark enough that I need the light on the tool, I’m probably already using Milwaukee’s Redlithium USB headlamp. Probably the biggest talking point on the Milwaukee M18 Fuel Mud Mixer feature set is the handle. And that’s for a couple different reasons. We’ve seen a couple other mixers on their way to retailers with D-handle designs on either side. One of those is from a brand that prides themselves heavily on ergonomics, so we have to ask the question as to whether Milwaukee’s dual pistol grip is the way to go. And there’s not a great answer to that question – it’s going to come down to preference. For me, the D-handle is a little more comfortable, but I feel like I have more control with Milwaukee’s pistol grips. Even though I can’t give you a conclusive answer on the style choice, I would like to see the handles a bit longer. With a pistol grip, the closer you can get your hands to shoulder width, the more natural the grip with feel. Another benefit of the pistol grip design is that Milwaukee can make it more versatile. With a lever lock on the left handle, it can rotate 180°. You can dial in an angle that works well for you or simply adjust it based on the application at hand. The maximum speed you can work up to is 550 RPM, which is fine for mixing. You can also use the Milwaukee M18 Fuel Mud Mixer for drilling in wood, metal, PVC, or composite materials if you really need to. It’s obviously not going to be a high-speed drill, but you can use it as an alternative to a Hole Hawg when a lot of torque is more important than the drilling speed. There’s enough muscle in the motor that it’s very effective in this regard. Understandably, the mixer’s physical design isn’t as optimal as a Hole Hawg’s for that kind of work, but the adjustable handle angle helps. We haven’t done a ton of mixing with denser materials just yet, but we like what we see so far. On the lighter side of mixing, there’s no doubt that the Milwaukee M18 Fuel Mud Mixer is very capable. But the asterisk we have to put on it at the moment is that we still need to use it for heavier mixing to know how well it will do in the medium to heavy-duty mixing applications. What can tell you is that Milwaukee rates it for drywall mud, stucco, thin set, mortar, and epoxy in addition to drilling in wood, metal, and composite materials. None of our testing so far indicated that any of these will be a problem. For what is typically a simple tool, the Milwaukee M18 Fuel Mud Mixer adds some features that make the tool more convenient to use. It’s likely the most intense discussion will be over the use of pistol grip handles over a D-handle. While I can tell you to consider the difference between mountain bike and road bike handlebars, it’s not much help and really comes down to preference. There are a couple of tweaks I’d like to see in Gen 2. However, it’s a solid tool that has the benefits of an intelligent design that keeps it a bit more compact than it’s competitors out there. While we like the performance we’ve seen so far, there’s still more testing to do before we can really dial in which materials we’re confident you can tackle cordlessly. At $349 for the kit with a pair of 5.0 AH batteries, the cordless convenience carries a premium over corded models. But if you’re set on M18 batteries, the bare tool is $199 – much closer to corded Pro models.